The Murray River Retriever formerly known as the Murray River Curly Coated Retriever is an Australian icon and Australia's only home grown retriever. The earliest reference to a similar dog has been traced back to 1844. They have been breeding true to type since at least 1894 when this picture was taken. The Murray is endemic to SE Australia along the Murray River system hence the name. It's primary use as a working dog was to retrieve ducks of punts. DNA Testing in 2012 demonstrated that the Murray is a distinct, diverse and separate breed on the gun dog spectrum not closely related to any other gun dog worthy or preserving. Further DNA results released in 2018 supported this hypotheses. The Murray survived 160 plus years without a breed club because of its ability to work and bond to its master.Today the Murray continues to work but can be found more often as a devoted family pet. In 2010 the Murray River Curly Coated Retriever Association was formed. 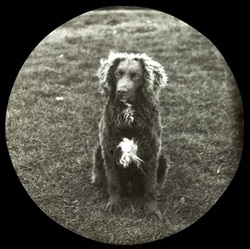 In October 2014 The Australian National Kennel Council unanimously resolved that the Murray River Curly Coated Retriever Association Inc. be admitted to the Sporting Register as a Kindred Body. In October 2015 the official name of the Murray and its Association was amended to Murray River Retriever by the Association and its members as as the ANKC felt the original name too close to that of the Curly Coated Retriever which is already recognised by them. In early 2018 an alternate Association for pet owners was also formed. There is a lot more work to do but basically this means that for those who wish to compete in trials, for hunters that use a Murray and owners that live in shires with restrictive breeding regulations that our Murray Association is now a recognized as a Kindred body helps.. However they need to be members of their breed Association and have their Murray registered to be able to keep them entire.. It is a small start but it is a start!